Teresa Wood/"SEA (Singular Extreme Actions)"
The laws of physics will be put to the test at "SEA (Singular Extreme Actions)," during PIFA 2018. The Philadelphia International Festival of the Arts (PIFA) returns to Philly in 2018. The biennial festival begins Thursday, May 31. We may have to wait a few months to experience the 50-plus performances from artists around the globe and the epic street fair on Broad Street, but we can start to get excited for what's to come. Prepare for 11 days of live theater, dance and interactive visual art installations, taking place on the Kimmel Center Cultural Campus and the City of Philadelphia's public spaces. The Kimmel Center has announced the PIFA 2018 lineup, although tickets aren't yet available. 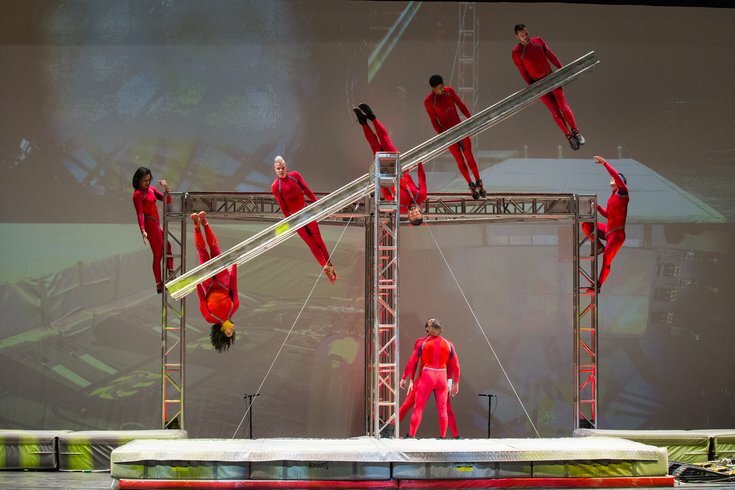 Sales start Tuesday, Jan. 30, at 10 a.m.
• The highly anticipated return of French performance troupe Transe Express, with a new world-premiere work commissioned by the Kimmel Center to debut in Philadelphia: "Cristal Palace"
Check out all the performances that have been announced here. The street fair, a 6-block party that will transform the Avenue of the Arts, will take place on Saturday, June 9, the day before the festival ends.